Austin’s BUILD Chicago youth center saw its usual steady stream of kids come in for after-school activities on a recent afternoon. About a dozen teens spent that time pecking away at computers searching for high schools and filling out enrollment applications. Angela Bowman’s 13-year-old son was among them, spending about an hour with a Kids First Chicago volunteer. Kids First Chicago, run by nonprofit New Schools Chicago, offers free enrollment workshops for families. About 200 students attended the three-week workshops at locations across the city, including BUILD, Austin’s Plato Learning Academy and the North Branch Library on North Avenue. “If you don’t know a lot about the high schools in the area, it makes it just easier for parents and 8th graders to know their options,” said Bowman, who also works at BUILD in its youth entrepreneurship program. That’s the idea behind the workshops, said Daniel Anello, New Schools Chicago’s CEO, who was there on that recent afternoon helping teens at BUILD, 5100 W. Harrison. Some 2,000 applications were filled out and submitted online during the workshops, in time for Chicago Public Schools‘ Dec. 9 enrollment deadline. CPS is expected to begin notifying students of which school/s they got into in March. The workshops were not just for 8th graders but any elementary school student or parent looking for high school information, Anello said. Of the roughly 250,000 students enrolled this school year in grades 1-8, about 27,000 are 8th graders, according to Chicago Public Schools data. Along with applying to schools, volunteers help families determine a school’s overall performance rating or if it has a selective enrollment process. “These workshops are really about helping families navigate options,” Anello said. And while some families know how to navigate the system to find good high schools, many do not, said Cymone Card, a community organizer with Kids First Chicago. For Bowman, who lives on the West Side, this was her first time looking at high schools for her oldest son. She said she started looking for schools during his 7th grade year. Bowman wants to find a high school nearby, not wanting to travel too far if there’s an emergency at his school. Bowman said her son’s not sure where he wants to go, but she’s interested in him attending a military academy. “He’s a young man, and I believe they need structure, and I think that would be very helpful for him. He has good test scores, so he wouldn’t have a problem getting into any school,” she said of her son, who attends George Tilton Elementary School in West Garfield Park. Kids First Chicago focuses on public high schools but helps direct parents to the best resources for private schools if that’s their choice. There’s also more to finding the right school than just academics, said Jade Jenkins, a community organizer with Kids First. The workshops helps students find schools with a good sports program if that’s what they’re interested in. For students with special needs or a medical condition, the workshops help make sure a school has a nurse on staff. It was mostly students attending the recent workshop at BUILD. Some helpers, like Jenkins, were on the phone with parents while helping their students. 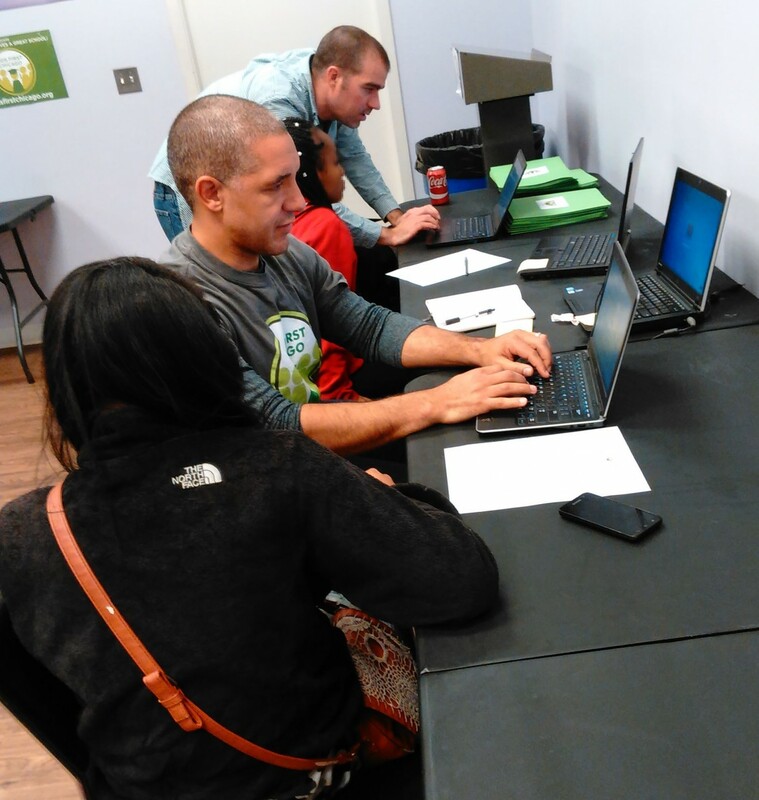 The nonprofit even helps families after enrollment session. Apply Jan. 16th from 12 to 4 p.m. at By the Hand Club, 415 N. Laramie. The application deadline is Jan. 31. In-person counselors can help West Sider residents enroll for the first time or change coverage under the Affordable Care Act on Jan. 30 and 31 from 10 a.m. to 2 p.m. at Loretto Hospital, 645 S. Central Ave.